WARNING: The following contains spoilers for Table 19. Read at your own risk. I decided to see Table 19 for one reason: Anna Kendrick. It's no surprise to anyone I know that I've got a soft spot for this hilarious, talented, tiny actress. When I got press releases for the film, I knew it would have to be added to my list — in spite of the fact that it looked like your run-of-the-mill rom-com. What I found was that while the film is not flawless and could use some refining, it is anything but expected. Eloise (Anna Kendrick) is a lot different than I anticipated, and each character at the titular wedding reception table has their own secrets and baggage (some that I saw coming and some I did not — my companion seeing this film, however, did call some of the twists). While romance is a part of this story and ultimately an important one, Table 19 is ultimately a film that focuses on the quiet inner-workings of people putting on facades to deal with the things that are difficult. It's definitely a character-centric film, especially in the last hour; and when the hijinks fade, it's easy to become extremely invested in each of these individual journeys. 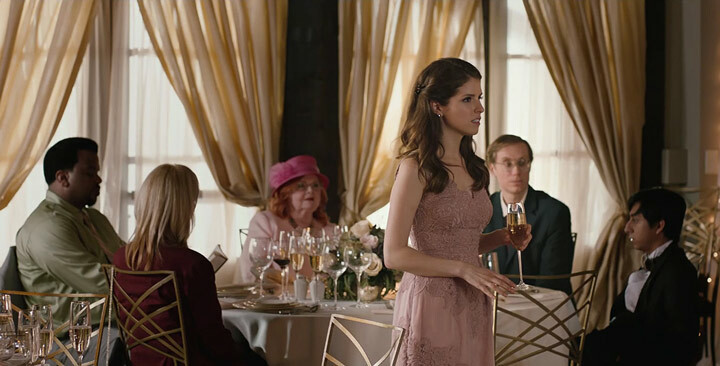 So let's get some of the plot out of the way first: Table 19 was promoted as a cutesy, cheesy little rom-com where Eloise attends her ex-boyfriend Teddy's (Wyatt Russell) sister's wedding, of which she was formerly the maid-of-honor. As the promos lead us to believe, the wedding features Eloise meeting a handsome stranger (Thomas Cocquerel) and falls for him. I assumed the story would drag on, with lots of jokes and gags between Kendrick's character, Cocquerel, and the rest of table 19, but I was actually pretty surprised when Eloise meets this handsome stranger, kisses him, and then he flees the reception within the first half of the film. Because while the promotional material would have us believe that this film is a love story between Eloise and her handsome stranger, Huck, it's not at all. Partially because it turns out that Huck doesn't exactly tell Eloise who he is, but also because the first unexpected reveal comes in the form of Eloise's secret. She's pregnant with Teddy's baby. Jo (June Squib), the bride's former nanny, observes Eloise and discovers this fact. The rest of the table rallies around Eloise, telling Teddy off for dumping her via a text message when she told him she was pregnant. We can stop here a moment to discuss what I really loved about this film: the complex relationship between Teddy and Eloise. We're predisposed to hate him based on the trailers. He dumped our heroine, after all, in a text and must be a terrible person. And while Teddy isn't exactly a knight in shining armor, we see that he's real and he's aware of his messes. There's something to be said about the way Table 19 promoted itself — luring me in, thinking that a whirlwind romance at a wedding reception with a handsome stranger was what I wanted, and causig me to immediately bristle against the ex-boyfriend. But what's so brilliant about the fact that the film makes Huck (that handsome stranger) the bad guy and redeems Teddy. It reminds us that reality is so much messier and infinitely more complex than some fantasy we've concocted in our heads. Everyone has secrets and everyone has issues, but the way we handle those makes all the difference. Self-actualization is important and throughout Table 19, we see Eloise and other characters fight against the mistakes and oversights that their emotions might have caused them to make. As the main character in this story, I love the fact that Eloise comes to the realization that she unintentionally hurt Teddy and also unintentionally emphasized the fact that she thinks he's a failure. It, again, would have been easy for this film to be a rom-com about finding a new guy and getting swept up in the romance of it all. Grand romantic gestures do happen in the movie, but Eloise's ultimate decision is to fight for those she loves. And Teddy eventually realizes to do the same. The relationship between Teddy and Eloise isn't perfect, but that's kind of what makes it so beautiful in the end. Relationships require you to fight for them. And that's something that threads through another story in the film — the one between Jerry (Craig Robinson) and Bina (Lisa Kudrow). Secrets come out for everyone in the movie (most impressively, there are a few scenes where characters air their secrets in different pairs and groups), but for these two, there's another layer. Bina decided to attend the wedding in the hopes of having an affair while there. She and Jerry don't really communicate well, and their marriage seems to just be stagnant. They run a business together, but there's no passion or communication anymore. When Jerry discovers Bina was there to have an affair, they confront one another about their marital issues. In a pretty powerful scene, the two realize that they don't actually even know one another anymore. Jerry claims he's the same person Bina married, but she rebuffs him by saying that he doesn't love her anymore. Jerry, meanwhile, claims that Bina is not the woman he married and that she's changed, too. It's a rather sad scene because of how realistic it feels. If you aren't careful, you'll miss that the person you're in a relationship with is changing — for better or for worse. The only way to prevent that from happening is by acknowledging issues and confronting them. Jerry and Bina had to learn how to be vulnerable — completely vulnerable — with one another in order to save their marriage. Even though it seems like Jerry and Bina get their happily ever after (an issue I take with most films is that the solution to marital problems is often oversimplified, and Table 19 does fall into this trap too), it's clear that it requires work and sacrifice on each of their parts to make that marriage a success. Their story was probably the most unexpected, yet enjoyable parts of the film. Since Table 19 takes place at a wedding, the Jerry/Bina story was a nice juxtaposition. While one happy couple begins their life together, another couple considers calling it quits. Lisa Kudrow and Craig Robinson absolutely nailed this story and made their characters more empathetic and relatable than any other actors would have been able to do. But even though we know Walter's secret early in the film (that he's in jail), we don't know why until a little bit later. And the result is indicative of Walter's personality. He's kind but too trusting, which is what landed him in jail in the first place. Merchant is probably the strongest comedic presence in this film and I wish that he had been utilized a bit more. Nevertheless, Walter's story was an unexpectedly sad little tale. And finally, speaking of unexpectedly sad, Jo's story might take the cake for the saddest one of all. We learn — once our motley crew decides to skip out on the rest of the reception and spend the day exploring the outdoors together — that Jo is dying and that she's afraid the bride, Francie (Rya Meyers) doesn't even remember her. Ultimately, Jo's is a story of living a life that you're remembered by. She's a caring old woman, who gives Eloise much-needed advice. The juxtaposition here is also not lost — that Eloise is bringing life into the world just as Jo prepares to leave it. June Squib's presence in this film was seriously needed and I'm thankful that her character served as a mentor to the others. Table 19 isn't a groundbreaking film by any means. It's pretty much tanked on Rotten Tomatoes, but I was honestly more impressed with it than I thought I would be. The marketing was smart in order to lure me in, assuming it was just another run-of-the-mill rom-com. But the stories that are being told are complex and not self-contained. The characters leave the wedding and adventure on their own. In the process, they learn more about life and love than they expected to. Eloise thought that she wanted a perfect guy to sweep her off her feet, but she realized that she's just as messed up as the next person. A ragtag table of people taught her that life is messy and complicated and you shouldn't punish yourself or others because of that. Finally, Francie and her new husband get the chance to visit table 19. While the group assumed they were at the table because they were rejects — unwanted outcasts who didn't belong anywhere — it's clear that this isn't how Francie saw them. She spoke to each one of them by name, remembering little details about their lives. In a film in which every main character assumes they're unwanted because they're damaged, it's refreshing to see a moment in which they're all celebrated. Because in the end, that's what Table 19 is really all about: celebrating the brokenness, messiness, and complexities of life and love.